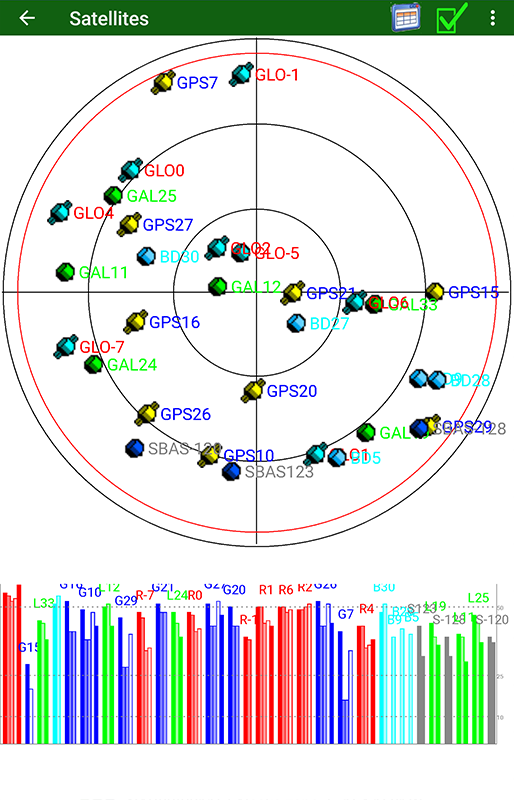 JAVAD Mobile Tools (J-Mobile) allows you to connect JAVAD GNSS receivers to your Android™ device via Bluetooth® or Wi-Fi. With an Internet connection, you can also connect to remote base stations. 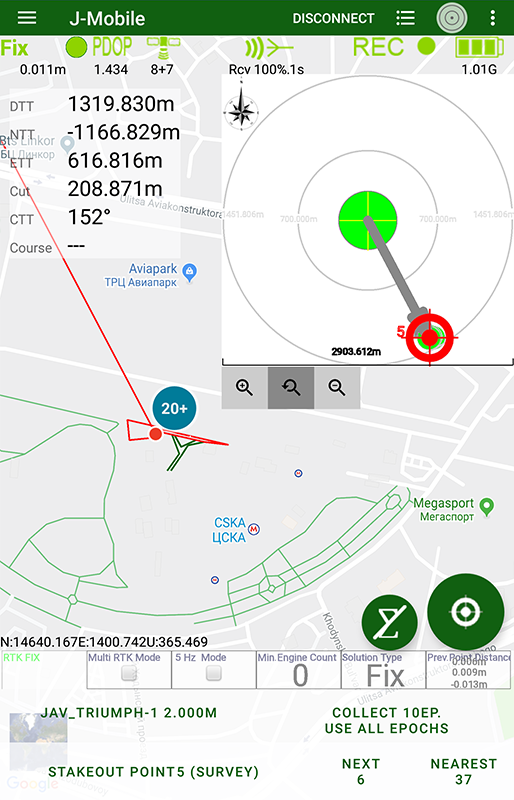 J-Mobile includes several tools designed for the JAVAD TRIUMPH-2, TRIUMPH-1/1M, ALPHA and SIGMA GNSS receivers including the Survey tool which gives you control over data collection: Static, Trajectory or Stop-and-Go for Post-Processing. 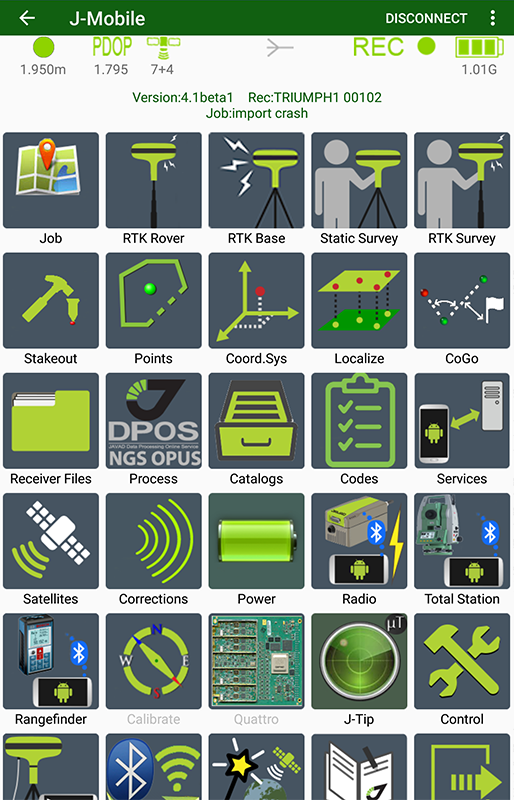 The RTK Survey tool allows you to do RTK surveying and stakeout with your Android™ device by configuring the receiver as a Rover while receiving corrections from NTRIP, RCV or a Base using radio transmissions (FH, UHF or RCV). Point, Trajectory, Offset surveying are available during survey. RTK survey can do with different unique JAVAD's techniques like Multy-RTK, Hybrid-RTK, Lift&Tilt etc. J-Mobile utilises large screens of your devices and let you do Survey and Stakeout with map. And let you combine surveyed points into objects to produces final result. Also you can annotate survey with audio notes and photos. 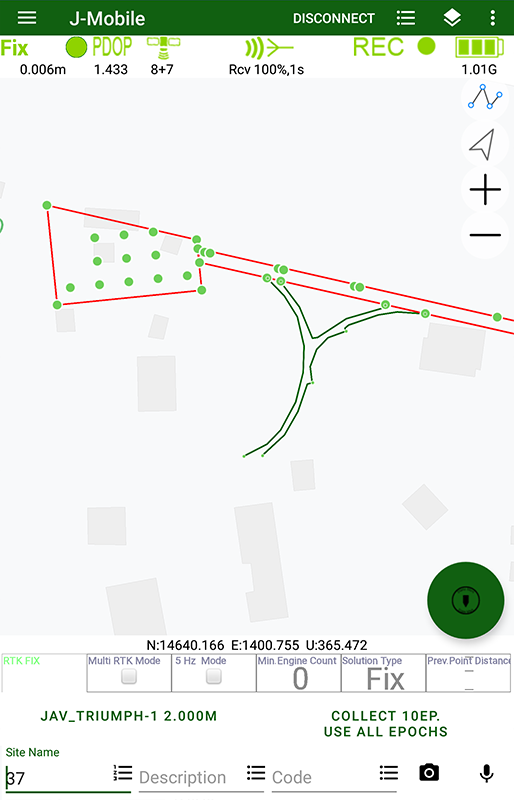 The results of the RTK survey can be exported into a custom plain text file or to different CAD/GIS files (DXF/DWG, MapInfo, ArcView Shape etc). 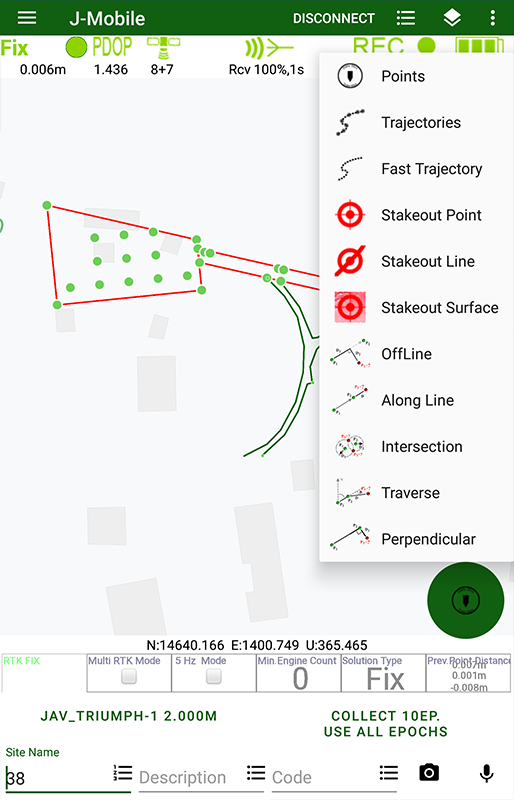 Design points for stakeout can be imported from custom text files or CAD/GIS files. 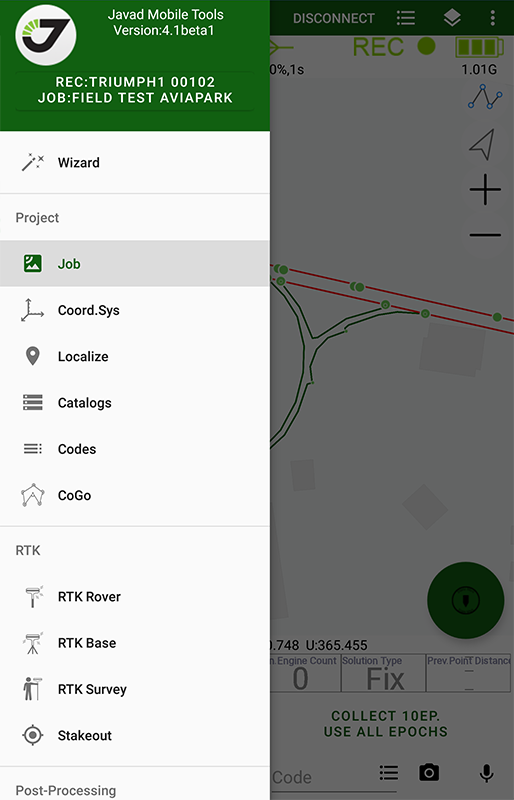 Using the RTK Base tool, you can configure and start the receiver as an RTK Base as well as configure and control the FH or UHF radio transmission settings via a Bluetooth® connection. 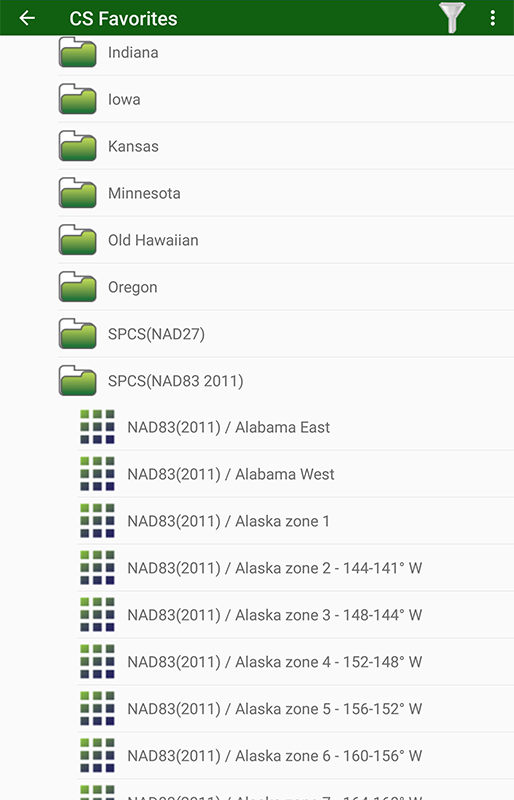 J-Mobile's File Manager tool allows you to download raw data (.jps) files from the receiver to your Android™ device which can then be immediately submitted to JAVAD's Data Processing Online Service (DPOS) using the Process tool. The Process tool also allows you to submit files directly to OPUS once the native (.jps) file format has been converted into the RINEX format, and yes, J-Mobile includes a tool specifically for that task (JPS2Rinex). JAVAD DPOS service can be used for process files worldwide as well. It can process .jps files and returns results immediately then base data are ready. J-Mobile organises your data with jobs for survey and design points and control point catalogs. You can use national and user defined coordinate systems and make localization with identical points. 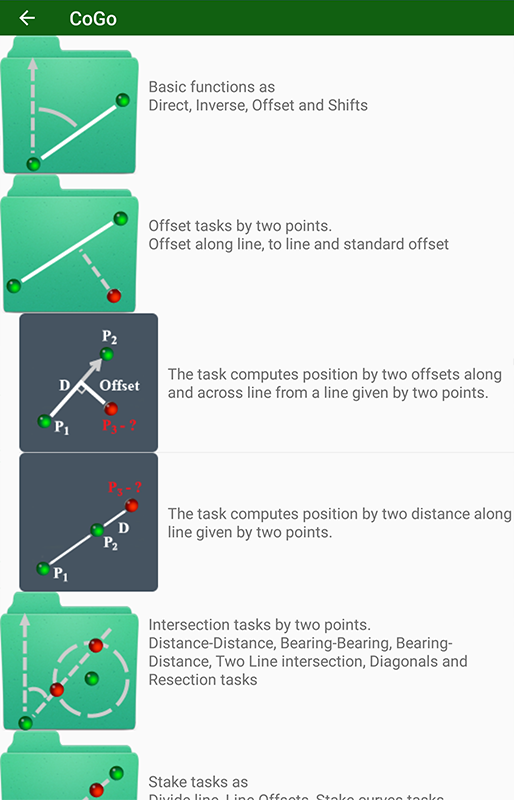 Coordinate Geometry (CoGo) tools let you calculate make computation survey tasks in the field, like Forward and Inverse tasks, Intersections, Divide line, Area/Perimeter/Volume computation etc. Other tools in the J-Mobile collection include Satellites, used for a quick glance at the availability and position of GLONASS and GPS space vehicles; Update receiver Firmware and OAF tools; Calibrate, a tool for calibrating the electronic compass and electronic level on your receiver; Pair Modem, a tool to enable the pairing of the receiver and the radio via Bluetooth®; Repeater, a tool used for extending the range of your radio's transmission through the use of an intermediary transmitter; Load HPT firmware to update firmware in a HPT radio; plus other tools.